Since it seems spring has officially arrived in Utah (Knock on wood!) I have been dreaming of getting away. Disneyland is always at the top of my list. Since that doesn't seem likely I decided to bring the magic of Disney here. And what better way than with a delicious beverage that screams spring? If you have never had the chance to try a Mint Julep in Disneyland I would suggest you grab yourself one ASAP. Until then here is a recipe to hold you over. Combine two cups of water and sugar in a saucepan. Place on stove and stir on medium heat until the sugar has dissolved. Transfer the mixture evenly to two glass jars with lids and add twenty mint leaves to each. Seal the lids and place in refrigerator. Let sit for at least a half an hour. The longer you let your mixture rest the more mint flavor it will gather. I let the mixture sit overnight and it was amazing! I recommend not letting the mixture sit for longer than 24 hours. Otherwise, the mint leaves will start to disintegrate and we will be removing them. Take the mixture from the refrigerator and pour through a strainer into a pitcher to catch the mint leaves. Discard the used mint leaves. We now have a simple syrup! Add lime juice and lemon juice to the syrup and combine well. Add four cups of water and stir. The syrup will be very sweet. Add more or less water to taste. Add two drops of green food coloring and mix. 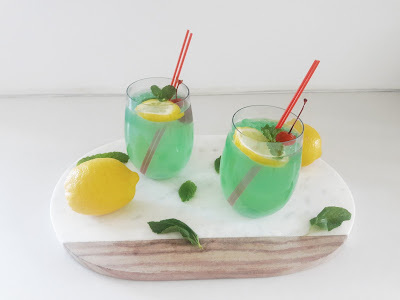 This will give the Mint Julep that signature Disneyland color. 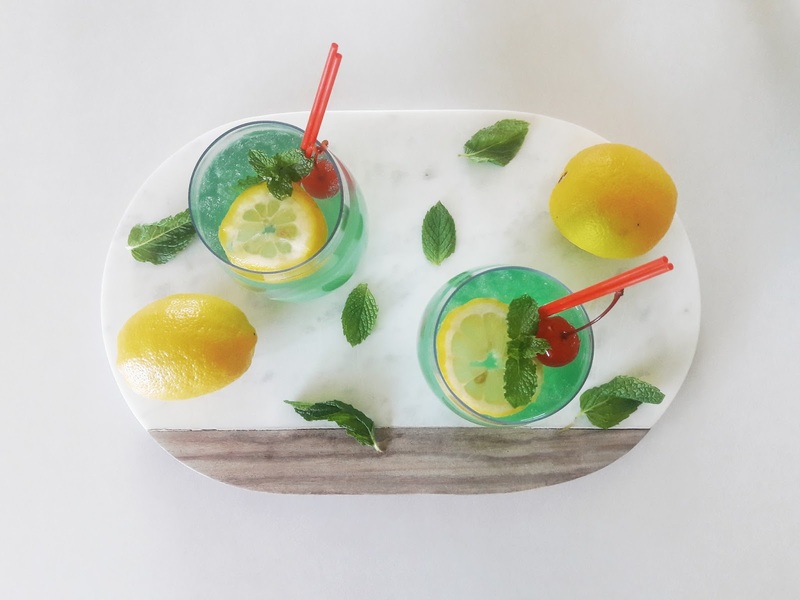 Garnish with sliced lemon, cherries and a sprig of mint. This recipe is delicious and made me feel like I was back in Disneyland. I can't wait to enjoy it throughout the spring and summer. 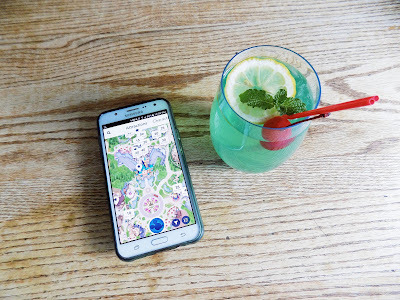 What are some of your favorite drinks to enjoy during the warm weather?